Automatic Storage Retrieval Systems (ASRS) An Automated Storage and Retrieval System, also known as ASRS Systems, in simple terms are equipment and computer controlled systems that quickly, precisely and accurately store, retrieve and handle materials and product from defined storage locations. They are designed to handle both unit loads which are goods that are palletized, as well as mini loads which can consist of goods stored in cartons, totes, and cases. Storage space is an issue, so increasing storage density is important. Where a large volume of loads is being handled in and out of storage. Where picking and shipping accuracy is high priority. Where safety is a concern to both materials and personnel. Where processing is not part of the equation, only storage, retrieval and transport. 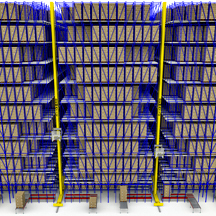 How do ASRS Systems Work? ASRS systems are computer controlled to help you manage and maintain your stored materials and goods. By telling the computer which item and how many you want retrieved, the computer then determines where within your facility that item is located so it can be retrieved, and then proceeds to schedule the retrieval. 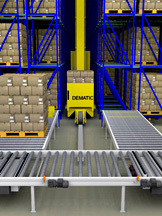 Retrieval & Movement of Goods -the computer directs the automated storage and retrieval machine (SRM) to the specific location where the goods are being stored to retrieve them and then redirects them to the new location where they will be deposited. Loads are commonly taken in and out of storage areas and moved to other section of the storage area, or to the manufacturing floor, or loading dock. Storage of Goods – the goods areplaced in the system input station, and the location of where the goods are to be stored is entered into the computer. 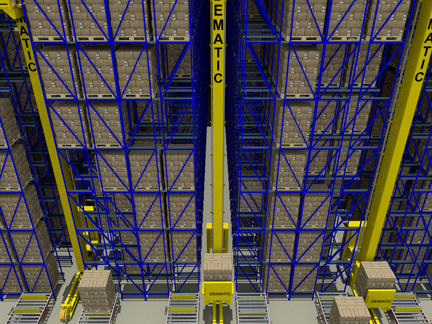 The ASRS system then proceeds to move the goods to the storage area, and off load it to the determined spot location for storage. As items are stored or retrieved from the storage area (pallet racks) the computer system updates the inventory. 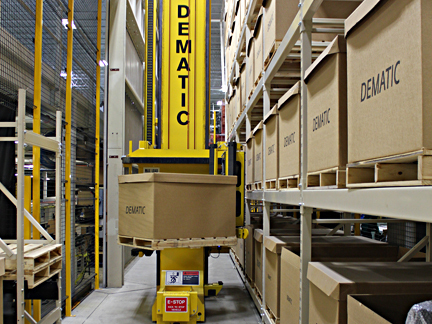 Increased Storage Space– ASRS systems allow for high density, narrower aisle storage of materials and product over standard pallet racking storage systems, which allows you to store more goods in less space. Reduced Labor Costs– automated processes help to reduce the number of workforce you need, and the costs associated with them. Decreased Errors – order picking and shipping errors are greatly reduced because the processes are automated. Improved Warehouse Organization– the ASRS computer system keeps track of all goods stored, where they are storage and how many. No more wandering up and down each aisle looking for what you need. Process Improvement– ASRS systems allow for order picking, packaging and shipping processes to work seamlessly together. Sequencing the output for retail store delivery and truck routing are commonly done today. Improved Inventory Control– ASRS systems allow you to track inventory levels, length of time stored, and who they are ordered from. Analyzing this data will allow you to better manage your inventory. Increased Safety – manual loading and unloading of goods by forklifts can lead to accidents no matter how careful you are. Accidents caused by human error are eliminated.